Why have contemporary playwrights been obsessed by Shakespeare’s plays to such an extent that most of the canon has been rewritten by one rising dramatist or another over the last half century? Among other key figures, Edward Bond, Heiner Müller, Carmelo Bene, Arnold Wesker, Tom Stoppard, Howard Barker, Botho Strauss, Tim Crouch, Bernard Marie Koltès, and Normand Chaurette have all put their radical originality into the service of adapting four-century-old classics. The resulting works provide food for thought on issues such as Shakespearean role-playing, narrative and structural re-shuffling. Across the world, new writers have questioned the political implications and cultural stakes of repeating Shakespeare with and without a difference, finding inspiration in their own national experiences and in the different ordeals they have undergone. How have our contemporaries carried out their rewritings, and with what aims? Can we still play Hamlet, for instance, as Dieter Lesage asks in his book bearing this title, or do we have to kill Shakespeare as Normand Chaurette implies in a work where his own creative process is detailed? What do these rewritings really share with their sources? Are they meaningful only because of Shakespeares shadow haunting them? Where do we draw the lines between interpretation, adaptation and rewriting? 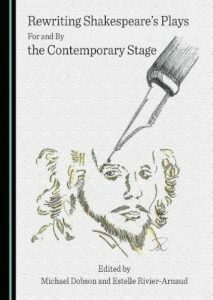 The contributors to this collection of essays examine modern rewritings of Shakespeare from both theoretical and pragmatic standpoints. Key questions include: can a rewriting be meaningful without the readers or spectators already knowing Shakespeare? Do modern rewritings supplant Shakespeares texts or curate them? Does the survival of Shakespeare in the theatrical repertory actually depend on the continued dramatization of our difficult encounters with these potentially obsolete scripts represented by rewriting? Michael Dobson is Professor of Shakespeare Studies at the University of Birmingham and Director of the Shakespeare Institute, Stratford-Upon-Avon, UK. His publications include Shakespeare and Amateur Performance: A Cultural History (2011), The Oxford Companion to Shakespeare (with Stanley Wells, 2001; revised, with Will Sharpe and Erin Sullivan, 2015), Englands Elizabeth: An Afterlife in Fame and Fantasy (with Nicola Watson, 2002), and The Making of the National Poet: Shakespeare, Adaptation and Authorship, 1660-1769 (1992). Estelle Rivier-Arnaud is Senior Lecturer at the University of Maine, Le Mans, France, and a specialist of Shakespeares drama on the contemporary stage. Her publications include Shakespeare dans la Maison de Molière (2012) and Shakespeare in Performance (2013), as well as numerous articles, play-reviews and a collection of poems. Since 2006, she has been directing an amateur theatre company, Act en scène, with which she is currently on tour.